Touted as a "grand observatory" to study planet Earth's water resources from space, NASA's Aqua satellite flew to its orbital perch today atop a Boeing Delta 2 rocket. The six-year Aqua mission began at exactly 0954:58 GMT (5:54:58 a.m. EDT; 2:54:58 a.m. PDT) as the launcher lifted off from its seaside pad at Vandenberg Air Force Base. With its liquid-fueled Rocketdyne main engine and six Alliant ground-start solid rocket motors firing, the rocket quickly punched through a deck of low hanging clouds and headed south from the central California launch site. Just over a minute into flight, the solid-fueled motors burned out and three more were ignited. The spent motor casings were jettisoned once the rocket cleared some offshore oil drilling rigs. The air-lit boosters fired as scheduled and then fell away two minutes and 20 seconds into the mission. After four-and-a-half minutes, the first stage completed its job and separated from the Delta's upper stage. The Aerojet-built second stage engine then ignited for the first of two burns needed to place the Aqua spacecraft into a polar orbit around Earth. Once that first firing was completed high above the Central Pacific, north of the equator, the stage and attached satellite cargo settled into a preliminary, egg-shaped orbit for a 42-minute coast. The vehicle traveled to the other side of the world, looping around the South Pole and continuing on a northbound course. 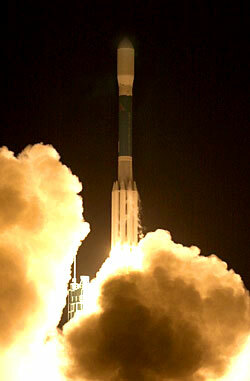 The second stage was then reignited for a short burst to circularize the orbit, setting the stage to deploy Aqua. Spacecraft separation occurred 59 minutes, 30 seconds after liftoff over eastern Africa. "This countdown is what we call a snoozer. Everything went per the script. We hardly were working any issues throughout the count. 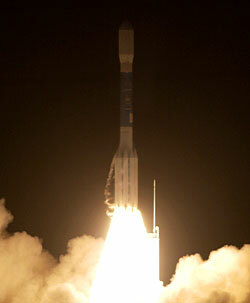 It appears the Aqua spacecraft got a great ride," NASA launch manager Chuck Dovale said after the flight. 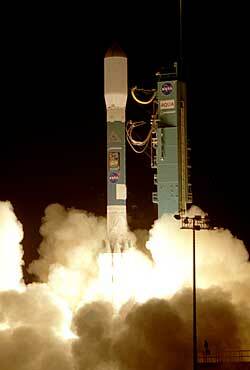 Aqua's $952 million mission seeks to gather data about Earth's water cycle. Scientists hope the wealth of information collected by the craft's six-instruments will assist in global climate change research and improve weather forecasting. "Aqua will observe our Earth's oceans, atmosphere, land, ice and snow covers and vegetation," said Claire Parkinson, the Aqua project scientist at NASA's Goddard Space Flight Center. "This comprehensive approach enables scientists to study the interactions among key elements of the Earth system so as to better understand our planet." "The Earth's climate is a very interconnected system," Parkinson continued. "Aqua, by measuring as many variables as it is going to be measuring, is going to help us to understand more fully some of those interconnections." "This mission is really a major major achievement in the field of Earth sciences because it allows for the first time to tackle problems at the boundary of traditional Earth sciences disciplines in a way that has not been conceived or done before," said Ghassem Asrar, NASA's associate administrator for the Office of Earth Science. "The main focus of Aqua is to understand how fresh water cycles throughout the planet," said Asrar. "Ninety-seven percent of our water resources are capped in the polar ice cap. Three percent is available for us. We're trying to understand how this very small amount of fresh water resources cycles through the entire planet." Aqua, which is Latin for water, was built by TRW. Over the next four months, ground controllers will check out the satellite and boost it into an operational orbit 438 miles above Earth before the six-year science mission begins. As a key part of NASA's Earth Observing System, Asrar calls Aqua a "grand observatory" that will "help us for the first time understand Earth as a system; how the atmosphere of ocean and life on Earth interact with each other, and how that forms the basis for sustaining the environment." With a growing orbital fleet of satellites to diagnose the health of our home planet, Asrar says scientists will be able to provide the information that government authorities need to make decisions about the environment. "There is no secret the Earth's climate and environment has changed and evolved since the beginning. The question in front of the global society is: What part of the change we are experiencing is the natural cycle? Some are seasonal, daily or shortened in time. And how much of it is due to human activities?" Asrar continued, "In the United States in the past 12 to 15 years, we've never had the mechanism in place that first translates our best scientific understanding in a form that's useful to policy makers." 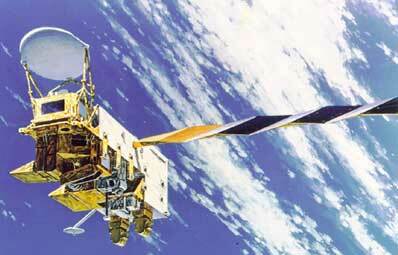 The Aqua mission also has the potential of improving the accuracy of weather forecasts. "If we can manage to improve the accuracy of weather forecasts just by a few percentages, and also bring our forecasts to be more precise at the local level, it would really help predict some of the surprises that we see in the form of squalls or more dramatic events we see in some parts of the country," Asrar said. Aqua is a joint project among the United States, Japan and Brazil. For Boeing, the next Delta 2 rocket launch is planned for no sooner than mid-June when a replacement Global Positioning System military navigation satellite is lofted into orbit from Cape Canaveral Air Force Station, Florida. The next Delta from Vandenberg isn't slated until fall. 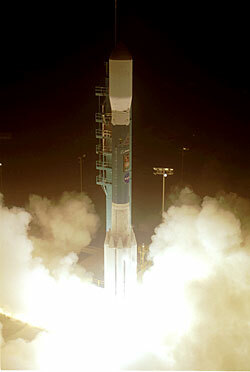 Aqua - General overview of this NASA spacecraft. Science goals - Aqua's science objectives and mission goals. Satellite instruments - Description of each of the six instruments on Aqua.